Some agents say wearing name tags brings them business. Tim Berube, an Atlanta real estate agent, says he’s closed a transaction with someone he met at Starbucks. Gloria Commiso, an agent in Torrance, California, has nabbed a client who approached her outside her office. And John Montgomery, based in Long Beach, California, recently collected a batch of leads at a party. All these agents credit the same thing for these business wins: the name tags they were wearing. Amid the spread of technology-driven lead-generation tools, it can be easy to forget about some offline methods for drumming up business. Some agents may even be tempted to dismiss such techniques as obsolete. But many agents continue to generate leads simply just by wearing name tags. Some wear the identification badges everywhere; others reserve them for specific settings, a recent Facebook conversation revealed. Not every agent is fond of name tags, however. Commenting on a recent thread in Lab Coat Agents, some disparage name tags as tacky and suggest that they reinforce negative perceptions of agents as pushy salespeople. “I used to hate wearing mine until I started getting business from it,” said Tristan Ahumada, an agent team leader in Westlake Village, California. Screen shot showing comments from a recent Facebook conversation on name tags. Consumers seem to perceive people with name tags as more approachable than others, proponents of name tags say. And if a name tag identifies someone as a real estate agent, consumers who are curious about the market or considering buying or selling a home may be tempted to strike up a conversation. Do you think name tags are too ‘old school’ and ‘retail’? “People always ask me, ‘How’s the real estate market?’ or ‘So, you’re in real estate’ then I take it from there,” Ahumada said. Montgomery said he recently attended a party at a $3.2 million listing. Mostly agents went to the event, but some neighbors and prospective buyers were also in attendance, he said. Montgomery said he was the only attendee wearing a name tag. Some agents shared tips for how to milk name tags for the most value, though these techniques weren’t necessarily endorsed by all commenters in the Facebook conversation. Wear the name tag upside down? Go-getters who aren’t concerned about coming off as ditzy sometimes will purposely wear their name tags upside down. “She will even wear it upside down or crooked sometimes so people will say Ma’am your name tag is crooked/upside down,” said North Charleston, South Carolina agent Rebekah King, speaking of a friend who uses the tactic. “Oh, thank you for telling me! So do you know anyone looking to buy or sell a home?,” she said her friend would respond, sometimes leading to new business. Wear name tags to retail stores? Wearing a name tag at a retail store is particularly effective at kindling conversation with people because consumers may mistake agents wearing name tags at retail stores for store employees, agents say. Wear different name tags for different scenes? Kim Jones, an agent in Baltimore, Maryland, wears tags that convey a theme, rather than her name. When she’s “promoting/prospecting,” she wears a tag with the phrase “#ParkvilleProudAndPositive,” the name of a Facebook group she founded. At out-of-town real estate functions, her name tag reads: “I [heart shape] to Give Referrals, Don’t You? 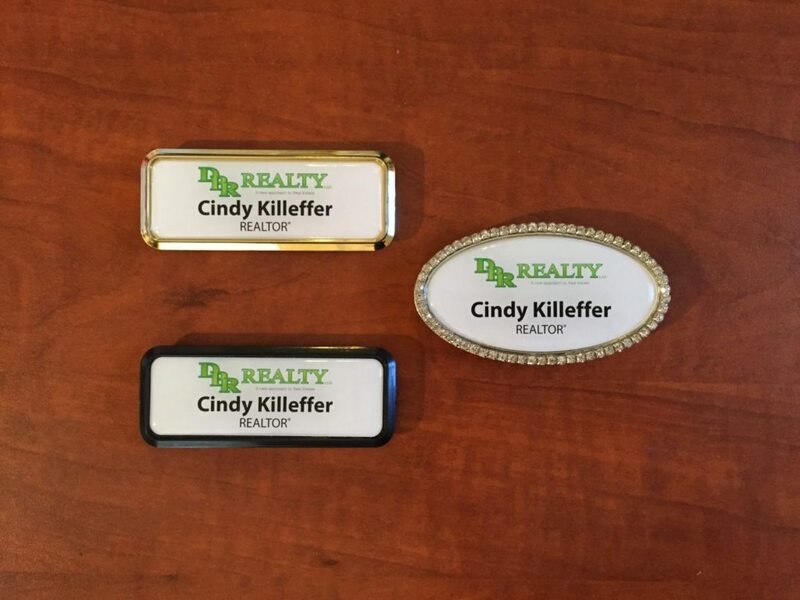 Cindy Killeffer, an agent in Gilbert, Arizona, is a name-tag connoisseur. She has three different ones, including a “swag/bling” version that she wears to networking events. Killeffer said she only wears a name tag in public when she’s going to the grocery store. The other occasions when she slaps on an identification badge include meeting clients for the first few times, door-knocking, real estate events and classes, and while shooting neighborhood videos and during open houses. Wear name tags to church? But other agents think name tags don’t have a place in certain settings or should never be worn at all. Some argued that agents who cater to luxury buyers and sellers might want to lay off name tags. Those who think there’s no place for name tags in real estate argue that since professionals like attorneys and doctors don’t typically wear name tags, neither should agents. Wearing name tags is regrettably “old school” and “retail” naysayers say. It invites comparison to retail workers who sell things that aren’t nearly as valuable as homes, they argue. Some recall a time before they entered the profession when they’d grimace when they saw agents wearing name tags. “Name tags? Sure, if your second job is at Burger King,” said Jyll Tooker, a Vernon, New Jersey agent. Name tag advocates, some of whom are millennials, regard critics as wrongheaded — snobs choosing to pass up potential business out of a misguided sense of dignity.